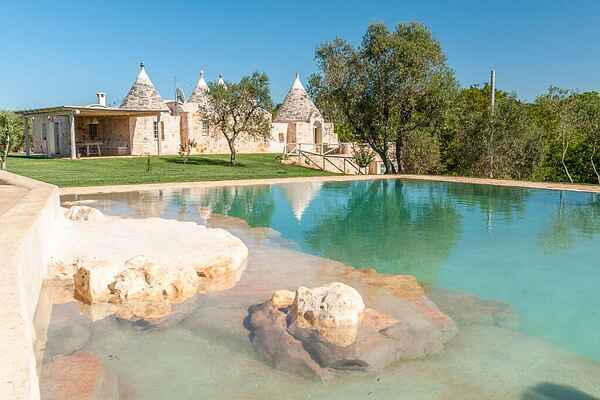 It is a large complex of luxury Trulli (more than 200m²) with a stunning natural rock carved pool. All the rooms of the villa are equipped with individually controlled air conditioning. The living area is covered with WIFI signal. The truòòo has recently undergone a careful renovation during which the characteristic parts of the trulli have been restored in its honor. The house has been modernized with the utmost care and offers its guests the highest comfort and luxury in an authentic setting. A large wooden gazebo has been placed just outside of the kitchen, where a large dining table allows guests to enjoy their meals. A few meters from this gazebo is a wood-burning oven and barbecue. The 12x6m pool is beautifully embedded in the rocks, of which a part has been leveled to form a small and safe area for children and some seats have been carefully carved out to allow people to sit partially submerged in the water. The trulli is surrounded by a well-kept lush green and the pool area is decorated with atmospheric lighting. This impressive holiday rental is equipped with outdoor cameras and alarm system. Ceglie Messapica is located in the province of Brindisi, on a hill, and is one of the oldest cities in Apulia. The old town is picturesque and consists of squares and streets of special beauty. Easily accessible is Ostuni, the famous white city, Brindisi and Martina Franca. About 40 km from the Safari Park Fasano for a trip outside the city and the beautiful seaside town of Costa Merlata is about 25 km.